The monastery, of which only the scantiest remains exist, was founded in 1474. The original monastery was destroyed and some years later the friars began to gather again upon the old spot, and built themselves some cottages amongst the ruins. In these cottages was compiled the most famous of those great Annals for which Irish literature is so noted, the Annals of the Four Masters. The book was so called because it was the work of four friars of great learning, the chief being Michael O’Leary, a native of Ballyshannon. The work these four men produced consists of 11,000 quarto pages, begins with the year of the world, 2242, and closes with A.D. 1616. 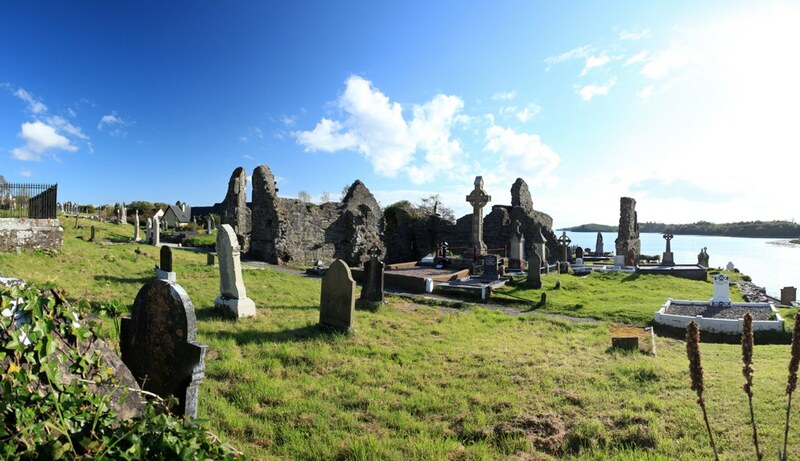 The Annals are made up largely of brief details and records of battles, of the foundation and destruction of churches and abbeys, and of the deaths of chieftains, kings, abbots, nevertheless they form a priceless storehouse of information about Irish history. In recent years these Annals have been twice edited, the last edition being a handsomely printed book in four large quarto volumes. Having said that, the grounds of the Monastery are a great place for photography and also a place for quiet reflection.